One of our most popular bread making courses, learn the ins and outs of truly great bread, with a day of mixing, kneading, baking and eating! 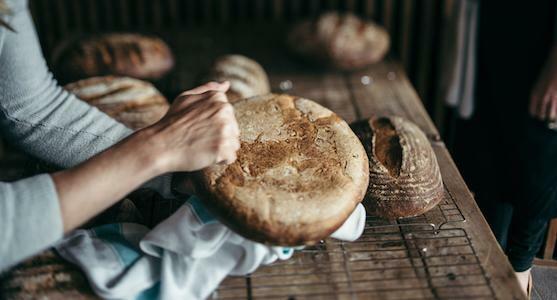 Bread Making is one of our original and most popular courses here at River Cottage HQ. Our chefs take you through every stage of the process from mixing, kneading and proving to baking and devouring the results. With the knowledge and confidence gained from this intensive one day you will be ready to tackle the joys of bread making at home. 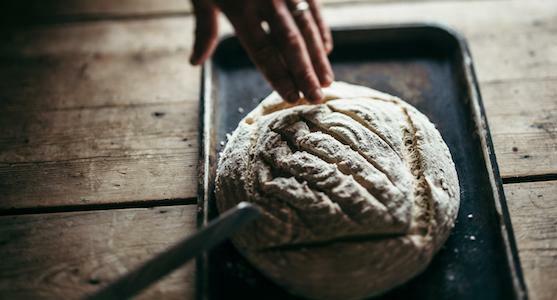 At River Cottage we bake all our bread including our classic farmhouse loaf so we begin the day showing you how to make this and the number of ways it can be adapted. 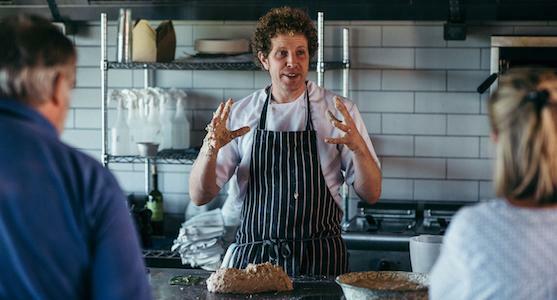 You will also explore international breads like focaccia and roti, make wood-fired pizza for lunch and create your own wild yeast starter, for a fabulous sourdough. Once you start making your own bread nothing else will do! A fabulous, informative and well taught course with lots of fun and delicious food . The friendliest staff who were so helpful, nothing was too much trouble. An awesome venue , can’t wait to come back again . 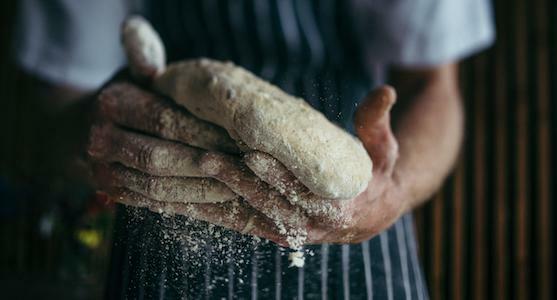 To begin, we cover the basics – looking at the ingredients, learning the differences between flours and yeasts, and measuring and mixing a great bread dough. You’ll have a go at kneading your own dough, which you will leave to prove as we break for coffee. 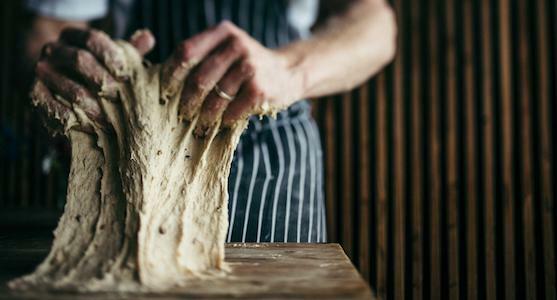 You’ll learn to ‘knock back’ your dough, then create focaccia and pizza to cook in our traditional wood-fired oven. 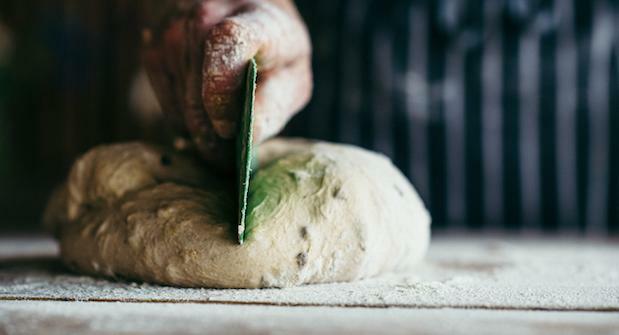 Once your dough has proved, you’ll master the art of shaping and baking your loaf to perfection. We’ll take a break for lunch, which will include your homemade pizzas and other local, seasonal produce prepared by the kitchen. Here you will learn to make an unleavened frying pan bread, such as flatbread, roti, tortilla or socca (a French chickpea pancake). Next there will be a quick lesson in rustling up the perfect speedy teatime loaf, soda bread. You will create your own wild yeast starter to take home, and learn how to use it to make a distinctively chewy, tangy loaf of sourdough bread. If there are any questions that have not been answered throughout the day now is the time to ask them and make sure you have all the expert tips you need for bread success at home. The tractor will be available to whisk you back up the hill at 5pm. Sorry, we’re afraid this course is not suitable for those with coeliac disease or wheat intolerances. However we do run Gluten Free Cookery courses.